Like Merchant Ships: What Is Cheerful Frugality? finding joy in simple things, spending less instead of more. Today I'm honored to be Simple Mom's guest writer. You demonstrate "cheerful frugality" beautifully. Off to check out your guest post! Finding joy in simple things -- I SO agree! 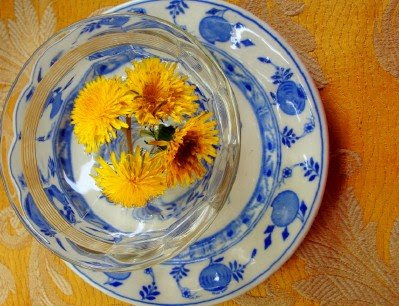 We have dandelions with clover (shamrocks) in a very similar glass dish on our table too. I never thought to put them on a pretty plate. I need to go back and re-read your archives! I promise--I'm not an all-night blogger. Baby John has an ear infection (again) and can't sleep. Now if I can just get my inspriational music on, which is "bluegrass' mountain music, I'll be good to go! Great read Meredith! We're familiar with good enough and do without here. But what I really need to work on is approaching these with an attitude of abundance instead of lack. Hope the little one feels better! How lovely! I'm finding joy in the startling equinox-snow outside our windows this morning, free to the beholder. What a great article! You always write what's in my heart but can't get out due to my foggy pregnancy brain. Glad to know you are not always up at 3am... sorry to hear about the ear infection. Praying it clears up soon. Will have to stop by Simple Mom tonight to read your guest post. I am sorry that the baby is sick, but you can always have your picnic another day. I just hope he feels better soon. Ear infections are so painful! Found you via your guest post at Simple Mom-- count me as a new subscriber because I couldn't stop reading! Choosing joy in the little things...it's the little things that ARE the big things. Jen -- I so want to remember your comment -- what a change in our lives if we decided to live this way! -- "Choosing joy in the little things...it's the little things that ARE the big things."